Past few weeks, I've had craving for Indian restaurant that I frequented more than 10 years ago... Oh, why haven't I been there for so long? Heading to the neighbourhood the other day, took the chance to visit Saffron for lunch. Saffron is a family business, serving Northern Indian dishes. The boss is looking not any less passionate as I last saw him, and upon checking with him, they have now been opened for 19 years... What a record! since nowadays we see many F&B open and close over a short span of operation. Checked the ala-carte menu, but saw the option for Set Lunch which is highly recommended...You get a portion of meat, vege, bread or rice plus yoghurt salad. 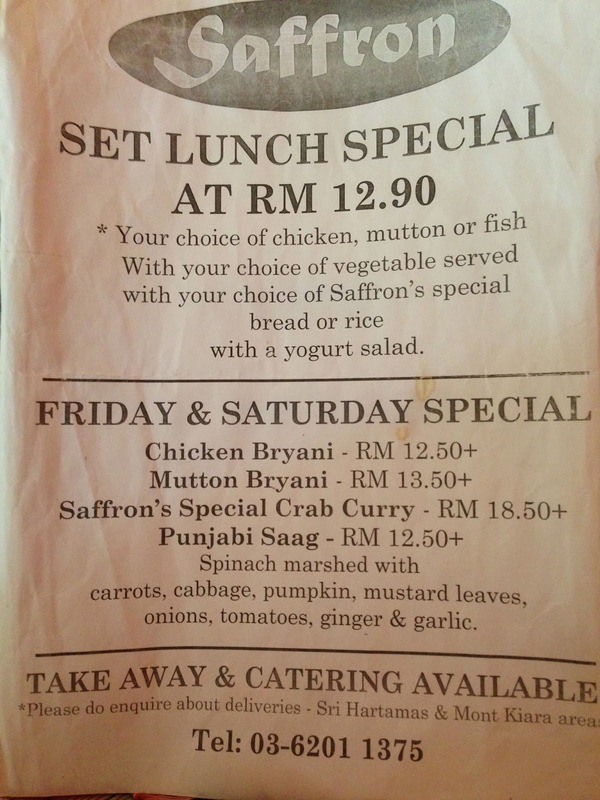 What else could we ask for, at the price of RM12.90 which offers you good quality food. 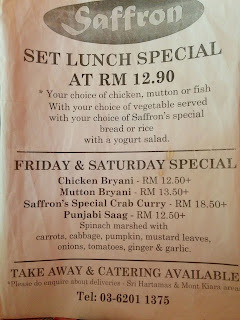 For the set lunch, we get smaller portion vs if we were to order them ala carte, but the portion given as part of set lunch isn't too little as well. So, worth it! For the 1st set, we opted for 'Butter Chicken', which is boneless chicken cubes braised in creamy almond and butter sauce, accompanied by 'Maharaja Baingen' which is eggplant spiced with garam masala. They both taste very rich in flavor. I have always loved their 'Bahtura', which is Saffron's specialty.. It's fluffy naan like bread, but this texture carries a slight crispiness and thin. As fr the second set lunch, we opted for 'Saffron Mirch Murgh', which is chicken and potatoes in spicy curry, flavored with dried chilli and curry leaves, "Sang Aloo' which is home-style potatoes cooked with lightly spiced spinach and "Bhatura". Overall the food in Saffron has just the right balance in flavor, spiciness and for those who appreciate spices, they will surely love the food served here. 0 Response for the "Saffron @ Sri Hartamas, KL "